Every year representatives of Federal agencies including the Department of Defense work with members of the Philly emergency management and public health community to simulate response to a catastrophic event. The name of this training exercise leaves one expecting to see Jack Ryan on scene defusing a bomb, or at least Morgan Freeman: “Liberty Down” (like “Blackhawk Down”). These yearly events are facilitated by the Philadelphia Federal Executive Board. The Federal Executive Boards were established by President Kennedy in 1961 to structure and reinforce communication and operations between the Federal government in Washington, DC and its satellite entities, agents, and programs throughout the country. The “Liberty Down” exercises are performed to hone continuity of operations during inclement circumstances, like a terrorist attack or an Ebola outbreak. The theme of these exercises, expected if still unnerving, reflects the law enforcement, public safety, and even political climate in which they are held – Liberty Down 13 used the scenario of a “politically controversial meeting” breaking out into a riot and ultimately into the partisans pulling out their heat and settling things with lead, an oft observed development of “politically controversial meetings” (they mean protests, right?). The Philadelphia Federal Executive Board hosted “Liberty Down 13,” our interagency emergency exercise, in August 2013. This year’s exercise was planned as a deployment exercise, although some agencies opted to conduct the exercise as a tabletop exercise. There were 23 agencies participating in this year’s exercise, which used a civil unrest scenario to challenge participants to consider the impact and their response based on a politically controversial meeting developing into a riot, and ultimately, to an active shooter situation. Of special note is that local federal emergency response professionals developed the exercise this year without the involvement or support of FEMA contractor assistance. GSA partnered with the Philadelphia FEB to conduct an Interagency Continuity Exercise called Liberty Down 14 on June 4, 2014. The format of this year’s event will be a guided workshop that will focus on – the operational impacts and continuity considerations that can result from an Active Shooter event and Social Media. Representatives from federal and local law enforcement agencies (e.g., the FBI, U.S. Secret Service, and DHS) and public affairs offices will participate on the panels. The exercise will provide critical insight as to how an Active Shooter event could impact your facility and operations as well as how social media can be utilized and managed during an event. It is understandable to wish first-responders to have the capability to mitigate any probable situation which they may encounter. However, conditioning emergency management and public safety personnel to approach every contentious political demonstration as a potential armed riot can be a self-fulfilling preparation, as has been demonstrated recently in the national theater. 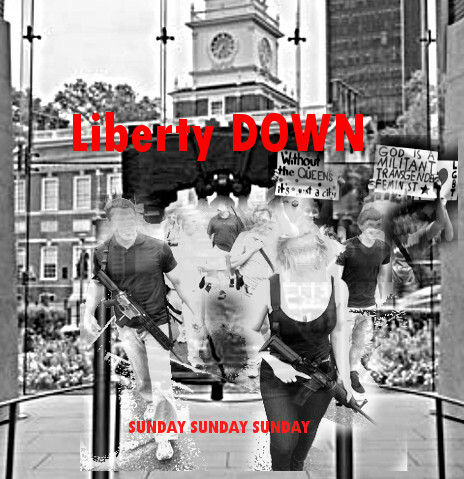 If we are going to be topical, I would suggest for Liberty Down 15 a seminar on what not to do when an officer kills a teen, and then what not to do when the community reacts with anger. To their credit, the Philadelphia Police have treated the local Ferguson solidarity actions with the utmost courtesy, in my observation(where reasonable). Philly Police Homeland Security chief tweets his positive reaction to the 2014 Active Shooter seminar.